Unions at Tata are now "unconvinced" the proposed merger with the German steel giant Thyssenkrupp should happen. This is despite previous support for the deal. It comes after the two companies proposed measures including the sale of Tata's Trostre site in order for the merger to get the go-ahead from the EU. The European Commission is concerned the joint venture would lead to reduced competition and higher prices in markets such as tin plate packaging. 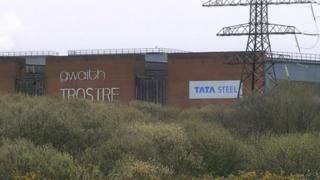 Tata's European Works Council (EWC), which includes UK and Dutch unions, said it was against the sale of tinplate works Trostre near Llanelli and other proposed measures. The Carmarthenshire plant, which produces tin used in the food industry amongst others sectors, employs 650 workers, including 100 new starters over the last year. But the unions are increasingly concerned the deal is less of a merger of equals and more of a takeover of Tata Steel by Thyssenkrupp. They are calling for an urgent meeting with Tata. "The way the process has been handled is completely unacceptable," said a statement from the EWC. "We are seriously concerned about the balance of power... and believe that future strategic decisions may prioritise the interest of Thyssenkrupp operations over those of Tata Steel Europe." The merger proposed that 2,000 jobs would go each from Tata Steel and Thyssenkrupp. But the EWC said the current proposals would see more than 2,000 jobs go from Tata while there was "no evidence" of similar reductions at the German company. Tata said last week a "comprehensive package of proposed solutions" had been submitted to the European Commission.